2016 has been the year of “Machine Learning and Deep Learning”. We have seen the likes of Google, Facebook, Amazon and many more come out in open and acknowledge the impact machine learning and deep learning had on their business. Last week, I published top videos on deep learning from 2016. I was blown away by the response. I could understand the response to some degree – I found these videos extremely helpful. So, I decided to do a similar article on top videos on machine learning from 2016. How to decide your own learning path? There can not be just one answer to this question. The anatomy of machine learning is quite vast. One needs to decide their own framework and time period to get comfortable with machine learning. Through this article, I want to help you reach that comfort zone. 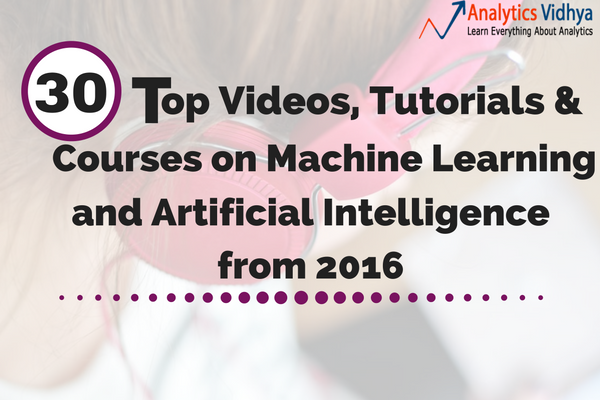 In this article, I have compiled popular and most viewed machine learning videos, tutorials and courses from 2016. I want to help you to get started with machine learning and gain expertise building predictive models using machine learning. You are free to decide your own framework and time period to watch these videos. It is always advisable to take baby steps but feel free to mould it as per your wish. In order to help you, I have arranged the article and suggested a way to go through them. Hope you find it useful. How to use this article? In this article, I have segregated the videos for beginner & advanced. The first section of the article will introduce you to machine learning basics and the underlying theory to make you get comfortable with the machine learning. If you are just getting started with machine learning then this section should be your first stop. Go through these videos one by one, and put the learning into practice with a practice problem. For those who already have a basic understanding of machine learning, you should start with the advance machine learning videos. These videos will introduce you to various machine learning libraries, modeling techniques and other advanced concepts of machine learning. Once you are thorough understanding with advanced concepts of machine learning, try your hands on Black Friday practice problem. After you have an understanding of how machine learning works, embark upon the next section on the applications of machine learning. These videos will blow your mind on how machine learning is changing the world. Find out how companies today are using machine learning to makes things simpler for us. This course on machine learning from the University of Waterloo will take you through machine learning basics and advanced concepts. It’s a conceptual course which will educate you on mathematical relations in ML algorithms. It has been taught by multiple professors including Shai Ben David, author of book Understanding machine learning. It covers topics such as linear regression, bayesian, trees, clustering, neural networks, ensemble, hidden markov model and much more. Check out the other course material here. Feel free to skip the first 8 mins of the video. This course is designed for all the Python practitioners looking for a comprehensive introduction to machine learning. It covers theoretical & practical concepts on supervised, unsupervised and deep learning algorithms. In this series of videos, you will learn about linear regression, K-Nearest Neighbors, Support Vector Machines (SVM), flat clustering, hierarchical clustering, and neural networks. For each algorithm, the speaker discusses the real-life applications with the help of actual datasets. Then you will learn about the workings of each of the algorithms by recreating them in code. This will provide you a complete understanding of exactly how the algorithms work, how they can be tweaked to our advantage. Here’s yet another tutorial to learn Python for data science. If your hectic work schedule has been making it difficult for you to start with learning data science then these videos are at your rescue. In these 7 min videos, you will learn how to get started with data science. It will introduce you to sentimental analysis, recommendation system, predicting stock prices, create neural network using python & tensorflow and introduction to genetic algorithms. The speaker is clear in his approach and will let you learn data science in your tea breaks. This tutorial requires basic understanding of Python. This is an exclusive tutorial by Sebastian Raschka and Andreas Muller from the SciPy Conference held in July 2016. In this tutorial, Sebastian introduces machine learning & Scikit Learn with sample applications. Then he will go on to explain the different computational tools for Python: NumPy, SciPy and matplotlib. Sebastian explains data representation using Iris dataset for machine learning. Andreas introduces you to classification and regression techniques in supervised learning. Sebastian then explains clustering technique for unsupervised learning and will make you familiar with the interface of scikit-learn, one of the widely used python libraries. It will also provide you hands-on experience in building a predictive model using Titanic dataset. This is a video from CS50 course taught at Harvard and Yale University. In this video, the speaker introduces you to machine learning and its applications. For all coders out there this is one of the best tutorials for you to get started with machine learning using Python. It is a simple introduction to machine learning and it is affecting our lives today. Learn how machine learning is being applied for building search engines, image recognition, voice recognition, and natural language processing. This tutorial will teach you image classification with Python and text clustering. Skip the first 9:05 mins of the video. As I described above, Pandas is one of the popular libraries in Python. This tutorial will take you through analyzing and manipulating data in Python using Pandas. Pandas ecosystem is growing more & more and it user friendliness makes data analysis simpler. This tutorial is aimed at any beginner who wants to get started with data analysis in Python. It uses climate datasets to learn about Pandas. After the success of Hadoop based Azure HDinsight Microsoft launched Azure Machine Learning (Azure ML) early this year. In this tutorial led by analytics experts from Microsoft Corporation, you will learn about Azure machine learning and how it is contributing to large scale consumerization of Machine Learning. The tutorial has been divided into four modules. In this first module, you will learn about machine learning advantage and AzureML studio. The second module will learn about AzureML and build recommender solution using AzureML. In the third module, the speakers will walk you through monetizing AzureML with Microsoft Azure marketplace. Azure Marketplace hosts various exciting APIs that use ML, including the Bing Speech Recognition Control, Microsoft Translator, Bing Synonyms API and Bing Search API. As of today, Azure Marketplace has 25+ machine learning APIs. Watch this tutorial to get hands on experience on AzureML. Machine learning is making systems so smart that they are getting closer & closer to replacing humans. In this these 10 min videos you will about the various applications of machine learning. By watching the first video itself you will be able to write your first code. In these videos you will learn about decision tree visualization, scikit- learn, tensorflow, how to build your own classifier, what is the most accurate features for your model and many more interesting concepts. The language used is Python. The videos are very informative and a must watch for any intermediate in data science. Although numeric data is easy to work with in Python, most knowledge created by humans is actually raw, unstructured text. By learning how to transform text into data that is usable by machine learning models, you drastically increase the amount of data that your models can learn from. In this tutorial, you will learn to build and evaluate predictive models from real-world text using scikit-learn. By the end of this tutorial, you will be able to confidently build predictive models from text-based data along with feature extraction, model building and model evaluation. This tutorial was delivered in PyCon 2016. Ever wondered how Netflix recommends shows based on your choice or how Amazon recommends you products they think you might also like. For any machine learning practitioner, these questions are no brainer. In this tutorial, the speaker introduces you to machine learning and how it is being used to solve various problems, build AI based games and many other application of ML. Well not just an introduction to these applications but you will learn how to build movie recommender system, chatbots, AI game and AI reader & writer. There are 5 min videos with key takeaways. These videos are meant for any machine learning hacker and requires one to have thorough understanding of machine learning concepts. Spark MLlib is a library for performing machine learning and associated tasks on massive datasets. With MLlib, fitting a machine learning model to a billion observations can take only a few lines of code. Along with this one can leverage hundreds of machines. In this tutorial, a senior data scientist from Cloudera introduces you through Apache Spark from scratch. You will learn about how Spark works and its execution model. The speaker has used several examples to explain the interactivity which Spark offers. It also covers the use of Spark’s DataFrames API for fast data manipulation, as well as ML Pipelines for making the model development and refinement process easier. In this tutorial, you will learn why should you use time series and what is the importance of time series analysis. The speaker provides a quick 10 mins introduction to Pandas to provide a refresher. Then you will see time series in action and learn how to deal with calendar dates in Pandas. The speaker will teach you how to understand the different time-stamped data like US-GIS, NIH, FRB, etc. Learn about the common time series analytical tools, prediction and classification in time series. Machine Learning is producing smarter gadgets and machines. Siri and Cortona is a result of major advances in machine learning. But, what goes behind creating these products. Let’s learn that in this video from Google data science team. The team first takes you through speech recognition and how it has been made possible. Then understand how machine learning is used on graphs to make image classification and smart replies a reality. It is an interesting video which reveals all the backend operations a machine performs for three major machine learning applications developed by Google. The recent progress of machine learning is impressive, and the applications seem endless. Neural networks are incredible tools allowing artist not just to analyze but also manipulate and generate images, movies and music. In this video, the speaker explains how The Google Cultural institute in finding ways to use machine learning for art and culture. In my last article on deep learning videos, we saw a video to create neural art. In this video, the speakers take you through all the fun stuff one can do with machine learning like Train Mario games, create artful collages using machine learning, create digital interactive images & videos. It is a very interesting video and I would recommend everyone to must watch it. Here is one of the amazing videos I have come across on applications of machine learning. Deep Learning is a subfield of artificial intelligence. Through deep learning, the aim of data scientists is to interpret the same functionality of a human brain into machines. In this Ted talk by Blaise Agüera y Arcas, Principal Scientist at Google he shares how machine learning algorithms and neural nets are used to build machine perception. In this video he shows how neural nets trained to recognize images can be run in reverse, to generate the same images. He explains this with several visual examples. Machine Learning can also be applied for understanding human genome, revealing a whole new world of personalized medication. In this video, Anshul Kundaje assistant professor of genetics and of computer science at Stanford explains how machine learning can be used for this purpose. He explains how the genomes of healthy individuals can be compared with their family members diagonised with a particular disease to identify disease associated genetic variants. I think this can be a revolutionary step in detecting early chances of diseases like Alzheimers and Cancer. In this video, Jure Leskovec, Chief Scientist at Pinterest explains how machine learning is used at Pinterest. It’s motivating to see how ML is transforming ways of businesses on internet. Here, Jure explains different segments of Pinterest driven by machine learning which affects new user experience, interest recommendation, type of content, user actions prediction, pin ranking and visual features. Jure also shares insights about what worked for them and what lessons they learned. I think it’s an interesting take on how machine learning is changing our day-to-day lives. Personally, to me it is surprising to see how machine learning can solve business problems at different levels. One such example is how Grab Taxi uses machine learning to tackle the problem of taxi availability. To handle this problem, Grab started a unique initiative of bidding for a ride by the drivers and the fastest bidder wins and is assigned the ride. Watch the full video to find out how they used machine learning to build a predictive model on drivers bidding probability and used real time data to solve the problem. Amazon Machine Learning (Amazon ML) is a service that makes it easy for developers of all skill levels to use machine learning technology. Amazon Machine Learning’s powerful algorithms create machine learning models by finding patterns in your existing data. In this tutorial, you will learn how to use machine learning with the data you already have to arrive at accurate and actionable predictions, i.e, to create smart applications. You will learn how to use and integrate Amazon ML into your applications to take advantage of predictive analysis in the cloud. I think this is one of the most fascinating technologies that will blow off every hot & shot organized retail. Amazon is using computer vision, machine learning, deep learning algorithms and sensor fusions to give you an out of the world shopping experience. Just to be clear, I am not promoting Amazon Go but trying to show you what all machine learning can do. To see what magic of machine learning can create, watch this video featuring robotics trained with artificial intelligence & computer vision. These devices behave like any other human. Meet these super smart robots who can perform any task you thought a machine won’t be able to perform. This video is a revelation of how robotics may replace human beings in the few years. The Connected graph is the answer to optimal business strategies and the key for growth in today’s world. The ability to utilize the connected data to understand the relationship between any user or customer. In this video, the speaker explains the graph database technology which uses AI, machine learning, and deep learning. You will learn about the basics of connected graphs and how they work. How AI forms the basis of these connected graphs and see knowledgeable connected graphs in action with popular use cases. Artificial intelligence powered computers have come a long way. The machines are so smart today that they can beat humans in any new game. AlphaGo gained significant attention when it won against the professional human Go player. But the questions is what goes in their brain and how are they able to perform that well. In this video, you will learn about Heuristics, production systems and deep neural networks which has made AI games a reality. Each & every industry is realizing the potential of Machine Learning. In this video, the speaker a machine learning practitioner in healthcare explains how machine learning can be used to detect diseases at their early stage. The speaker suggests the same technology which is used in self-driving cars, AI powered games can be used in detecting the early signs of a disease. If you are wondering how this is possible, then it is basically by using massive data available with hospitals and analyzing the patterns within the data. Imagine how many lives can be saved if hospitals start using machine learning on regular basis. How Google uses machine learning? Hear from the Google’s machine learning team, how they have been using machine learning to produce products one couldn’t have imagined. Learn more about Google’s take on machine learning and AI, how machine learning has streamlined Google’s end products. Also, it has deployed practical AI throughout its products and has brought an end user closer to the technology. I hope you enjoyed reading this article. Now that you know, all the popular and must videos in machine learning from 2016 tell me how are you planning to watch to them. I would also like to know your feedback on this article. Kindly, drop in your comments below and share your opinions. If you have watched any of these videos, share your reviews with me and other users in the comments section. I hope this article was a great value add to your knowledge. Through this article, I wanted to ensure that you’re ahead of your learning goal. If there is any particular tool or technique you would like to focus on in 2017 then tell us which are they. Just for your knowledge, we are giving away reference guides for Machine Learning, Python, R, Big-Data, Deep Learning and many more. To download these guides, click here. Great collection, Swati! Sounds interesting! Thanks Dev.I’m glad you found it helpful. Thanks for sharing this Swati. it must have required good amount of efforts. I think its slightly tilted towards Pythan compared to R. I am new to Analytics and wants to learn R first, before starting with Pythan. I have been studying machine learning from 4 months. The machine learning beginners articles on AV and the above tutorials have really helped me. Wow. Too good. Thank you for pulling this all together. Great collection; three sections are also helpfull. Thanks for putting effort to this. Appreciate it. However a bit overwhelming. it would be good to have 3 top videos/tutorials for each section. Feedback taken, will keep this in mind next time. I am currently a Student Researcher at the Malware Lab, Ben Gurion University at the Malware Lab. In July’16, I participated in a full scholarship summer course on Data Mining and Business Intelligence for Cyber Security. Be’ersheva is the Cyber capital of Israel and the experience at the program with hands on sessions on Machine Learning pioneers from all over the globe is enriching. Full Scholarships and basic stipends are provided for high potential indian students. could you please find out if any one of them are available free of cost. I’m glad you found it helpful and all these tutorials are free of cost.